Book Review: Off The Grid By Nick Rosen. 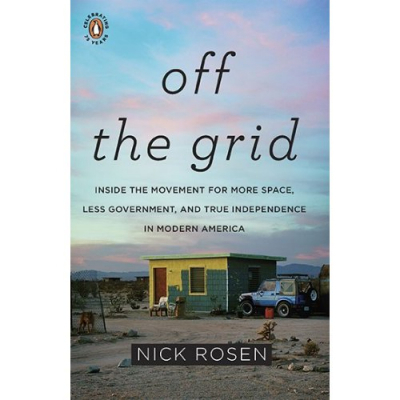 I just finished reading an advance copy of Nick Rosen’s new book Off the Grid: Inside the Movement for More Space, Less Government, and True Independence in Modern America, and wanted to give you guys a quick review of it. In the book, Brit Nick Rosen takes a trip across America looking for all sorts of characters living off the grid, and he finds them: from hippies, survivalists, and old-school Mennonites to those who were just looking for a simpler way of life, Rosen meets up with all of them, filling us in on how they (or attempt to) make it work for them. The book is not a “How To” book, at all; rather, it is a collection of stories and interviews assembled into a cohesive package that is easy to read and digest. While it does refer to Walden several times (what book about off grid living doesn’t? ), Rosen does his best to avoid comparing everyone he meets to the elusive woods-dweller, as not all of them are living this lifestyle only to escape consumerism and a materialistic society. They all have their own reasons, and each one is just as interesting as the next. A lot of the individuals mentioned in the book reside in Taos, NM, where I used to live. Considered by many to be the “off grid capital” of the US, I can attest to the fact that there are a ton of people there living alternative lifestyles. Tents, yurts, earthships (here is my post about staying in one), geodesic domes, passive solar houses – you name it, and someone there is trying to do it. It was interesting to read about some of the characters and locations that I knew about already, even if Rosen didn’t care for Taos or most of its residents. In fact, Rosen seems to pass quite a bit of judgment onto those living some of these off grid lives, and I admit that after a while it did kinda bother me. I loved his honesty about the different situations, as I much prefer honesty over any kind of glossing over, but I feel like some of the people in his book were painted in a rather negative light that wasn’t necessary to the telling of their story. Their stories are interesting and enlightening just as they are! He can be brash, harsh, and unapologetic – all traits that can be infuriating at times but that also make the book a very solid page-turner. You just know you are reading about his true experiences and feelings and not stuff just dreamt up as he was sitting down to write the book. And behind it all, you do get the drift that Rosen truly cares about these people and their situations, as he himself lives off the grid part time and thus probably understands some of the issues they face.